For most owners, building a superyacht is more than a construction project; it is an emotional journey, a path to realising a dream. On this journey, few things are more important than having the right design and build teams in place, both in sync with the owner’s ethos. As he embarked upon his first new-build journey, Okko’s owner was looking for a comfortable yacht with clean design inside and out, one that exuded a homey feeling with a unified interior décor theme. He wanted to see the same thing and feel the same way, whether he was in the main saloon, the bridge or a guest cabin. He found a kindred soul in Greek designer Giorgio Vafiadis, who values clean lines above all else. ‘Beauty lies in simplicity,’ he says. ‘A lot of designers like to play and create shapes. I try to take away all those things, instead of putting things in.’ They began the process four years ago, with Okko’s build commencing just over two years before her delivery at the Mondo Marine shipyard in Savona, Italy – chosen based on referrals from several of the owner’s friends. Mondo Marine considers each project as a custom entity, which worked in the favour of Okko's owner, who was looking for something different from the yard’s previous 41 metre tri-deck yachts. Although the series shares the same hulls and technical platforms, from the waterline up Okko's look is distinctly her own. The lines drawn by Vafiadis reflect the simplicity favoured by both him and the owner; they are straight where previous builds were curved. Vafiadis’s careful shaping of the superstructure also created more volume than other same-size builds. Frakè was this choice. 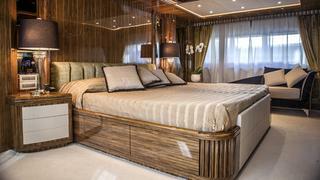 Sourced from South America, it is characterised by the distinctive contrast of its beige streaking. Almost half contains light beige stripes, so to keep it uniform, these parts were discarded. 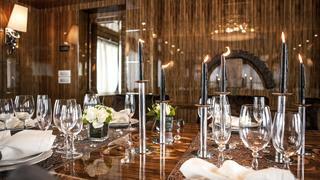 It was then painstakingly arranged to match the grains, and finished in high gloss for added drama. Mirrors and galuchat (stingray) leather in shades of cream, brown and ivory are also part of the singular motif. Vafiadis used these elements to put a bit of a modern spin on the owner’s classic tastes. Frakè joinery, galuchat overheads and mirror accents adorn all the guest and owner spaces from the bridge deck to the lower deck on Okko. 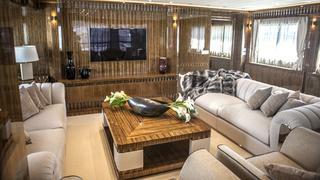 The bridge deck saloon features custom-designed furniture as well as pieces from Fendi and IPE Cavalli, which surround an 80-inch television. Blackout curtains transform this area into a cinema. The lower-deck guest accommodation comprises two doubles and two twin cabins with Pullman berths. The owner’s suite occupies a generous space forward on the main deck and includes an en-suite lavished in marble and back-lit onyx. The eight-strong crew of _Okko _enjoy a convenient lounge on the main deck to port of the galley. Particularly for service crew required to work late hours, it’s a great bonus to have a place to rest on the same level as the guests. The galley itself is small, due to the addition of a second wardrobe in the master suite that took a corner of its space, but it’s well designed for use by the chef alone. Outside the chef’s domain is an area for the service crew to work. It was a specific captain recommendation that other crew be able wash dishes or get a drink of water without infringing on the chef’s space. A dumbwaiter here serves the bridge and top decks. Forward of the galley are stairs leading down to three en suite cabins for six crew members; the captain and his wife sleep adjacent to the bridge. Abating noise and vibration was an important consideration for the owner, and at this _Okko _excelled. While soft-mounting all floors and ceilings on rubber is a common way to solve noise and vibration issues, Mondo Marine extends the concept to bulkheads. The shipyard invests a lot of resources in improving all aspects related to vibro-acoustic dampening, including finite element method study of hull structures. A perfect example is the suspended deck over the bridge aft deck, which extends about eight metres. 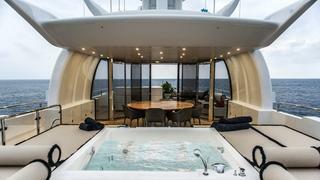 Most other yachts have pillars supporting the overhang due to the vibration in the hull structure from the engine room. Instead, Mondo Marine uses a bulwark structure that dissipates the vibration. Yet Okko has a semi-displacement aluminium hull. She cruises at 14 knots and reaches a top speed of 16.5 knots on her twin 1,500hp MTU 12V 2000 engines. 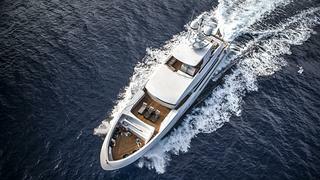 At 12 knots, she offers a very respectable 3,000 nautical mile range. Underneath the leather, stone and glossy joinery is easy access to piping and cables and this, says Fresco, is what sets Okko apart – what you can’t see. ‘A lot of people going aboard a yacht judge her quality from what they see, but quality is hidden. This is what allows an owner to have a yacht that, after 10 years, is still the same,’ he says. Okko herself can be seen in the Mediterranean or Miami, two favoured cruising grounds of this owner, who is enjoying his yacht as much as he did the design and build process.